tl;dr: What do we do with comments asking a user to fix their question, when "fixing their question" is impossible? It has an easily defined problem statement. 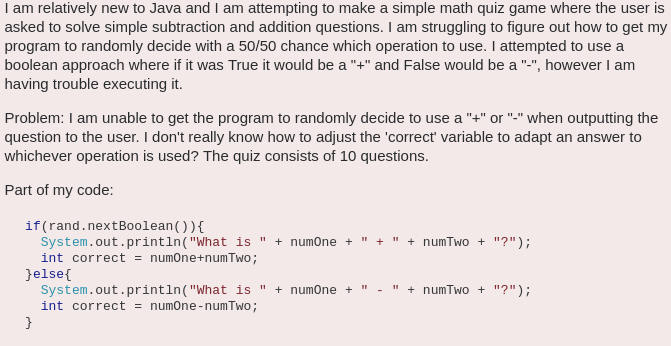 Code is accessible and made apparent for the actual problem. However, the problem with this question is simple: it lacks clarity on what the actual problem really is. That is to say, we don't have enough context into the actual issue to determine if an answer we provide would be addressing a symptom, or addressing the actual problem. Therefore, we can't reasonably answer it, and closure is an appropriate moderation action on it. As an analogy, think of someone asking you in person how to address a leak with their kitchen sink. You could suggest putting a bucket underneath the pipes, or tell them to cut the flow of water off to the sink so that it stops pouring water over the edge. Only one answer addresses a root cause, but the latter answer requires way more additional context. It's easy to see how a question like this would be "dead-on-arrival". There's not much in the way of editing that would really satisfy us here (and if there is I'd love to know), since the real issue is one of, "Yeah, I see that this variable is out of scope, but...what else is going on? What are you not telling me?" The crux of my issue is that the comments don't motivate salvation here. I encounter this pattern a lot on the site, in which people who do mean well on Stack Overflow make a comment to encourage the OP to include more details, when doing so is simply a fool's errand. The solution for this problem (from the perspective of an expert) is simple: a variable is out of scope, and this is likely a typo which can be resolved without a question here. I don't think we can stop the questions that come in like this; the only thing we can do is move swiftly to close them. What I'm concerned about is what we do with those comments. How do we address that? You have determined that this question is so far gone that it's not salvageable, and you don't think that it's worth your time to try to help the author fix it. That's great. You've made your call, you can go on to find another question that's worth your time to interact with. Other people may not agree. They apparently think that the question and/or its author aren't beyond hope, that they can help the author understand why their question is lacking and how to correctly approach their problem. They may or may not be correct in that determination, but either way, it's their own time to spend; if they want to spend it trying to fix that post, rather than one that you think is more salvageable, it's their choice. If you come across a question which you personally classify as dead on arrival, it is probably best to downvote it, close vote it, and move on. That is really all you can do with the question itself. As for the the other aspect you describe, the comments... If you feel the need to comment in an attempt to improve the post, then by all means do so. However, I don't think it is productive to stop others from doing so at all; so long as the other comments were valid. Even if the post has absolutely no chance of ever surviving, some of those comments may at the very least help the person asking by providing insights into why the post was removed and also by providing guidance in how to move forward with a more productive post in the future. So long as comments are scoped and respectful, there is no need to prevent them or chastise those who post them solely because the question itself is going to be removed. If you see comments which are not respectful or on topic being posted on questions which are going to be removed, then flag them. Not the answer you're looking for? Browse other questions tagged discussion comments low-quality-posts moderation . Should the title of duplicate questions be edited after a question is closed? Should questions be as simple as possible or try to add more context? Should a mod tidy up this popular question which is actually two questions? How to address snide remarks about an OS? Is it ok to answer a closed question on the question which it links too even if they are not really the same question? How can I find a balance between overexplaining (which wastes time) and underexplaining (which leads to negative feedback)? Are Gnuplot questions outside the scope of Stack Overflow?